If the House Speaker gets his way, regulatory change for the financial industry will come sooner than later. Banks would benefit tremendously from the Republican plan to cut regulatory red tape in the financial services industry. Image source: iStock/Thinkstock. At a retreat this week for Republican lawmakers, Speaker of the House Paul Ryan told his colleagues that passing legislation designed to deregulate the financial industry would be a top priority in 2017. It remains to be seen exactly what the reforms will look like, but irrespective of the details, it's almost certain that Bank of America (NYSE:BAC) will be a major beneficiary of them. Banks are operating in one of the most inhospitable environments in decades. Interest rates play a major role in this, as the ultralow rates since the financial crisis have weighed heavily on banks' top lines by reducing the yields on loans and fixed-income securities. But a stringent and adversarial regulatory approach has been of equal importance. In an effort to stamp out abuses that led to the crisis, the Dodd-Frank Act of 2010 instituted a number of new, strict rules that banks must abide by. These include tighter capital and liquidity requirements, annual stress tests, and a ban on propriety trading. It also established the Consumer Financial Protection Bureau, which has gone on to fine financial institutions more than $10 billion for a variety of consumer abuses in the five-plus years of its existence. Though even more significant than the letter of the law has been the way it's been enacted by regulators. The Federal Reserve in particular has wielded its newfound power aggressively, frequently failing banks in the annual stress tests and vetoing institutions' plans to raise dividends or add to their stock buyback authorizations. The net result is that banks aren't nearly as profitable as they were before the crisis. In Bank of America's latest quarter, it returned only 9.9% on its tangible common equity. That's meaningfully below its own internal goal of earning 12% on its tangible common equity, and it's also almost certainly below its cost of capital, which I estimate to be 11.7%. This means that Bank of America is eroding shareholder value and as opposed to building it -- that is, after taking into consideration the opportunity cost of not pursuing alternative investment options. What will help Bank of America more than anything is the ability to regain control over its capital plans. The nation's second-biggest bank by assets has increased its dividend only twice over the past eight years. That's led to an enormous amount of capital building up on Bank of America's balance sheet. Indeed, even though the North Carolina-based bank is smaller than JPMorgan Chase, it nevertheless has more capital. 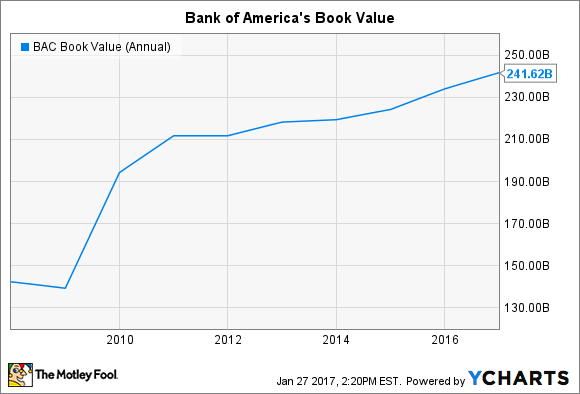 BAC Book Value (Annual) data by YCharts. This isn't a bad thing from a safety and soundness perspective, as many people believe that a lack of capital caused the crisis in the first place. I don't agree, as I think the abuses that fueled the crisis came from outside the traditional bank industry, from investment banks such as Lehman Brothers and mortgage brokers such as Countrywide Financial. The point being, undercapitalized commercial banks weren't the core issue a decade ago. Either way, while requiring backs to hold more capital should indeed make them safer, it also makes it hard for banks such as Bank of America to generate the type of profitability that investors expect from a bank its size. Consequently, if the regulatory reforms free banks up to distribute more capital to shareholders, thereby purging the funds from their balance sheets, it will translate into higher profitability for Bank of America and, almost certainly as a result, a higher stock price as well.